House Mice control can be accomplished by snap traps, glue boards or multiple mouse traps. They have a tendency to store food. If using a baiting program it is best to use a bait blox used with a rod in a Mouse Protecta Bait Station, so they don’t carry the bait off for storage(such as pellets) for later consumption. Baits should be placed close to the suspected activity. 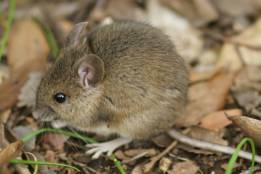 Since mice have a higher population number than rats, they are more widespread. Do I have a house mouse or a young rat? A young rat’s head will be proportionally larger to its body a mouse’s head or their feet as seen in the Field Identification of Domestic Rodents. The adult house mouse is small and slender and about 1-2 inches long, excluding tail. The house mouse has large ears (as seen photo below), pointed nose and small eyes. The tail is as long as the head and body combined. The fur color varies, but it is usually a light gray or brown but could be darker shades. The House Mouse weighs about 1/2 to 1 oz as an adult. Mice can be identified from young rats by the size of the head and the hind feet. A mouse prefers seeds, cereal grains, or sweets but will eat almost anything. Mice do not need much water; they get most of their water requirements from their food. Farms and granaries are often infested with mice as they eat large quantities of stored seed and grains.